This summer David Zinman retired as music director of the Zurich Tonhalle Orchestra. Before the birth of Ionarts, we enjoyed listening to him conduct the Baltimore Symphony Orchestra and were sorry to see him leave Charm City, but thanks to his series of recordings from Zurich, now available in a box set from Sony, we have kept in touch with his work. So it was a homecoming, in a sense, when the American conductor took the podium of the National Symphony Orchestra last night at the Kennedy Center Concert Hall, for the first time since 2009. The skilfully arranged program focused again on classics of the early 20th century: after Webern and Schoenberg last time, here it was Schoenberg's Five Pieces for Orchestra, op. 16, paired with Strauss's tone poem Also sprach Zarathustra, op. 30, from which it is not too distant, in time or character. Unfortunately, many listeners who would have benefited from the lesson Zinman offered probably saw the name of Schoenberg and stayed home. The scholar Carl Dahlhaus noted, in his book Schoenberg and the New Music, that Schoenberg's op. 16, composed in 1909, is one of the pieces that "divides the New Music from the nineteenth century." However, it is also "bound up with the tradition of programme music, the very tradition that was the quickest to become obsolete in the twentieth century and which fell into disrepute as representing all that was bad in the nineteenth century," an element that marks a continuity in this program between Schoenberg and Richard Strauss. Zinman conducts with a no-nonsense and authoritative beat that is such a breath of fresh air by comparison to Christophe Eschenbach, and Zinman left no fat on the bone in his approach to this Schoenberg, either in the barbaric march-like qualities of the first movement or the solo cello- and celesta-marked aura of nostalgia in the second. Here is a primer of the possibilities of a large orchestra and a much broader understanding of what is "acceptable" in terms of dissonance. As Dahlhaus put it, before Schoenberg arrived at the ordering concept of the twelve-tone system, Schoenberg's music was informed by two ideas: "the difference between consonance and dissonance is one of degree, not of kind," and "tonality is not a natural law of music but merely a formal principle." The third movement is associated with Schoenberg's coinage of the term "Klangfarbenmelodie" (see Dahlhaus's book for an assessment of what Schoenberg meant), and here the floating orchestral colors smoldered inside their slowly changing static state, capped by shocking climaxes in the final two movements. As to what story the work might be telling, Schoenberg chose to remove the programmatic titles added to the movements at the time of the work's publication. Dahlhaus observed that Schoenberg's decision was unequivocal: "Extramusical premisses did indeed exist, but he did not 'give them away'; they did not belong to the work itself, merely to the circumstances of its creation, which were the private concern of the composer." In the middle, Mozart's Piano Concerto No. 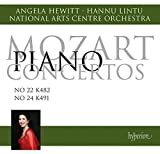 22 (E-flat major, K. 482) was disappointing, not because it is not an ingenious and eminently likable piece, which it certainly is, but because the soloist, Angela Hewitt, and the orchestra were too often at odds. Hewitt is a gifted recitalist, where she has the freedom to shape each phrase in minute detail exactly to her liking; straitjacketed by an orchestra accompanying her, her performance often felt rushed and a little jumbled, except when she was playing completely by herself. The second movement featured her best playing, as well as excellent turns by the orchestral musicians in the section for wind ensemble and the funny flute-bassoon duet -- this is the first Mozart concerto to feature clarinets in the orchestration, and the use of the winds is extraordinary. 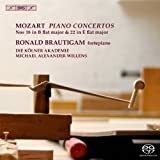 Hewitt's cycle of the Mozart concerti has not become a favorite, either, possibly because it is in competition with the always surprising and endearing cycle by Ronald Brautigam on pianoforte -- both soloists released their versions of no. 22 this year within a couple months of each other. This concert repeats tonight and tomorrow (October 10 and 11, 8 pm), in the Kennedy Center Concert Hall.